7.5 MM Cushion Cut Forever One® Moissanite by Charles & Colvard 81 Facets - Very Good Cut (1.80ct Actual Weight, 2.00ct Diamond Equivalent Weight) by Forever One® at Social Seeker. MPN: 04H-CSH-7.5-4HV. Hurry! Limited time offer. Offer valid only while supplies last. 7.5 MM Cushion Cut Forever One® Moissanite by Charles & Colvard 81 Facets - Very Good Cut (1.80ct Actual Weight, 2.00ct Diamond Equivalent Weight). 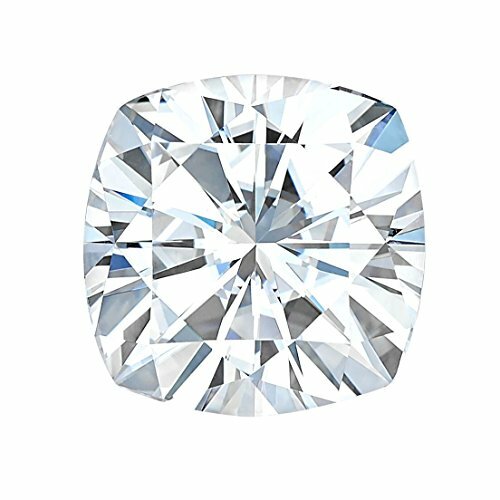 7.5 MM Cushion Cut Forever One® Moissanite by Charles & Colvard 81 Facets - Very Good Cut (1.80ct Actual Weight, 2.00ct Diamond Equivalent Weight). Charles & Colvard Forever OneTM Moissanite is the newest addition to the Charles & Colvard family. A triumph of art, science, and sustained effort, Forever OneTM is an unprecedented achievement - a colorless gem in the D-E-F range, with the extreme hardness and robustness inherent in all Charles & Colvard Created Moissanite®. Charles & Colvard Created Moissanite® is a result of rigorous scientific research and development, attention to detail, and adherence to a standard of quality which is unyielding. And it's a process that is continually evolving; as learning grows and improvements are introduced, the quality and purity of the stones becomes more refined. This focus on quality extends to the work of dedicated gem cutters, who have developed techniques which highlight the high surface luster and extremely reflective nature of Moissanite, increasing its already intense brilliance. Known to many as "The World's Most Brilliant Gem®", with unsurpassed fire and brilliance, this unique created gemstone is the ultimate in affordable luxury. The exclusively patented process produces a superior created gemstone that is confidently backed by a Charles & Colvard® Limited Lifetime Warranty, which assures that its brilliance and fire will never fade. The Charles & Colvard® Certificate of Authenticity ensures that your Moissanite gemstone is an original of exceptional quality & craftsmanship. Because it is grown in an American laboratory, Charles & Colvard Created Moissanite® is a responsible alternative to mined gems, providing jobs without damaging the environment. Charles & Colvard Created Moissanite's durability means that its beauty and value will endure forever. With this gem's hardness second only to diamond, it's extremely resistant to scratching, abrasion, breaking, or chipping. If you have any questions about this product by Forever One®, contact us by completing and submitting the form below. If you are looking for a specif part number, please include it with your message.